As you approach the cliff ledge, the whole valley comes into view through a break in the trees. Below, the dark waters of the two lakes are surrounded by a blanket of forest. The top of an ancient monastic settlement pokes above the canopy. There is nobody stirring in the valley. In the early morning chill, the only sounds are the birds going about their business. This really is a special place. 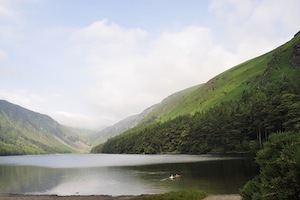 This is Glendalough. There are nine marked trails around the valley, beginning at the information office beside the upper lake. Before venturing off on one of them, take a moment to savor the view. 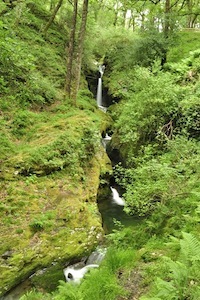 The water’s still surface is bordered by native oak, holly, and ash interspersed with introduced scots pine and beech. Beyond the far shore, the bare mountain is scored down the middle by a stream draining the surrounding uplands. The water collects peat along the way, giving the stream and the lakes their dark brown color. The boardwalk between the two lakes takes you across a marsh. This mini reserve is teeming with wildlife. If you like dragonflies, they are here by the dozen! Peregrine falcons may be seen hunting other birds overhead. A special treat is the regular sightings of red deer that have wandered down into the valley. When they come close to the boardwalk, a four-foot-high fence is all that separates you from these wild creatures. Away from the lakeside and monastic “city,” it is worth the extra effort to climb the hillside to the quieter trails. Here you are in different company. Jays, red squirrels, treecreepers, and magpies zip from branch to branch. The elusive pine marten scurries through the canopy. In early summer, look out for the wild floral display — the forest floor comes alive with colorful bluebells, wood anemones, and wood sorrel. Foxgloves display their fantastic pink flowers by the path edges. Well over 1,000 species of animals and plants have been recorded here, so keep your eyes open! Back near the upper lake, the Poulanass waterfall cuts through the forested hillside and crashes to a gurgling plunge pool. The water is spewed out into a stream which races off toward the lakes. Inhale deeply here — the air feels fresher. It’s as if it is washed by the tumbling water. From Poulanass, the trails toward the Spinc are for “real” hikers. It is a steep climb to the high cliff ledges, from which you have a panoramic view. From here, take in the sights — in the valleys below, the forests cover every crevice and contour. The canopy is broken only by the lakes and the roads slicing through. The hilltops are blanketed in a shorter canvas of green. In early summer, the green is broken by the yellow blaze of flowering furze. It creates a spectacular display. 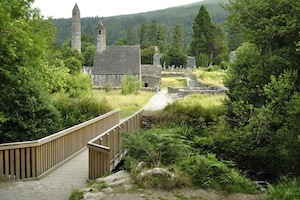 The best time to visit Glendalough is early morning — afternoons are busy. Even at peak times, though, taking one of the marked forest trails will bring you away from the bustle. Buy a trail booklet from the information office, +353-404-45425 or wickloweducationcentre@environ.ie.